A retired Flight Attendant, Pamela had just started writing her award-winning blog, Portland Firefly, a few months before her March 2009 diagnosis of Primary Peritoneal Carcinoma, a rare type of aggressive ovarian cancer. She was the keynote speaker for the American Cancer Society’s Relay for Life Survivors Luncheon and is a Teal Ambassador for the National Ovarian Cancer Coalition. A featured speaker on the panel of Survivors Teaching Students through the Ovarian Cancer Alliance of Oregon and Southwestern Washington, she makes it a priority to attend the Ovarian Cancer National Alliance Conference annually in Washington DC. A portion of the proceeds from TIE ONE ON goes to support ovarian cancer awareness, education, advocacy and research. 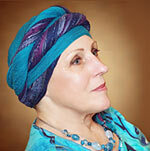 Pamela’s second book, HOW CAN I HAVE OVARIAN CANCER? I DON’T HAVE ANY OVARIES! will be published in 2012. It chronicles her odyssey through the maze of symptoms, diagnosis, chemotherapy, recurrences, and living with a life-draining disease in the hope of helping others through this time in their lives. Copyright © 2019 Teal Books.